On a recent trip to Swope Park in Kansas City, I had the opportunity to see my niece’s public debut during a Vietnamese dance performance at the Kansas City Ethnic Enrichment Festival. As I entered the park on a hot and humid Saturday, I was suddenly transported back to my childhood, when my family would attend the festival to help cook food for the Vietnamese tent and I would occasionally perform a dance with the youth group. The park was filled with tents of many different countries, including Ethiopia, China, Greece, and Venezuela—almost every continent was represented. The representation of all the countries and the eagerness of individuals to learn more about each other was a great reminder of how much richer our country is because of its immigrants and its diversity of cultures. This year’s Ethnic Festival, with over 40,000 attendees over a three-day span, included more than 50 countries showcasing their native foods and performing ethnic music and dance pieces. In Colorado, we’ve seen a large influx of people moving to the state—we are currently the second fastest growing state in the country. Black, Asian, and multiracial groups have also experienced an increase in population, with the Latino population seeing the largest increase. In Garfield, Arapahoe, and Adams County, the proportion of white residents declined by more than 10 percent, making Aurora the first major city in the state to be a “minority-majority” city, with 53 percent of its residents identifying as non-white. The increased diversity in Colorado brings both opportunities and challenges for health care providers, health systems, policymakers, and community-based organizations to create and deliver culturally-responsive care. Cultural responsiveness has become more important than ever, in order to ensure we are providing quality and effective services that meets the needs of all Coloradans. The importance of cultural responsiveness plays a significant role in health outcomes as our state country increase in diversity. In our work in Fort Morgan, we’ve uncovered eye-opening concerns that community members face in getting their health care needs met. We learned quickly that the way we’ve traditionally approached access to care issues must be approached much differently in area as diverse and rural as Fort Morgan. We have learned that not every concept—such as health equity or even race—is translatable; as a result, we need to adapt our approach, tailoring it towards the communities that we are working with. Recently, our country has been experiencing a lot of hate and divisiveness, especially with federal policies that are anti-immigrant and exclusionary, such as the end of DACA and bans on immigration. 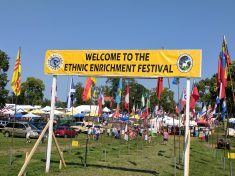 However, attending the Ethnic Enrichment Festival was a good reminder of how we can come together to celebrate our differences and similarities, and—if only temporarily—escape from the dominating narrative to embrace our many cultures. The resiliency and strength of many of these communities through generations of barriers and being made to feel unwelcome is impressive and beautiful, and I hope it’s something you’ll seek out to experience for yourself.